The Fusion Menu Board Wall Mount is Chief’s newest edition to their line of ceiling mounted solutions to execute digital menu board application. "The menu board wall mounts leverage many of the same features installers loved about the ceiling mounted versions," said Kathryn Gaskell, Product Manager. 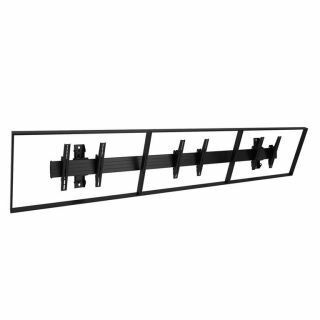 "We've also worked closely with customers to add problem solving features they needed in a wall mount." The new mount offers flexible display positioning and adjustments. The single horizontal extrusion with depth adjustment aligns displays quickly, even on irregular mounting surfaces. The mount allows for easy access behind the displays for servicing and storing media players. Each menu board mount uses two or three wall plates to minimize drilling time.